A method of bushing wrestplanks…. I was given the opportunity to do some restoration work on the instrument pictured in plate 102a of Raymond Russell’s ‘The Harpsichord and Clavichord’, an instrument of Iberian origin which was the subject of a paper given by Beryl Kenyon de Pascual and myself at the Galpin Society Edinburgh Symposium in June this year. The paper (to be published in GSJ) however does not cover any actual restoration techniques, and this instrument posed a problem for which I have always wanted to find a good solution, that of efficiently bushing sloppy or oversized tuning pin holes. Bushing with any sort of dowel has always seemed to me to be unsatisfactory, since the grain of the bushing is easily crushed (although I have been told that bushing with ebony dowels works well). 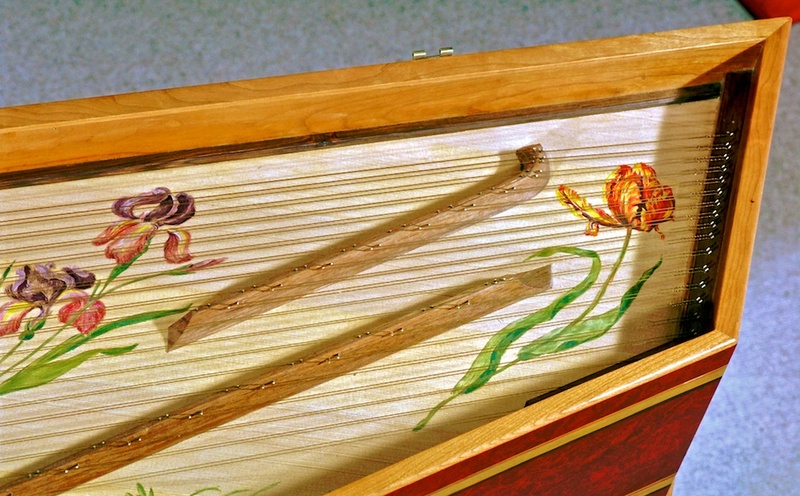 In this case, an original set of tuning pin holes, set out at bichord piano string spacing, had been filled; and new holes drilled in different positions to conform to harpsichord string spacings. This was probably done by Arnold Dolmetsch, who fitted a set of old tuning pins (these were probably taken from an 18th century square piano; they are a shade over 5mm in diameter, filed to a slight taper, with holes for the wires and oblong heads). These pins were removed in 1974 (they are still kept with the instrument) when it was suggested to the owner that to remedy tuning instability a new set of pins should be fitted! 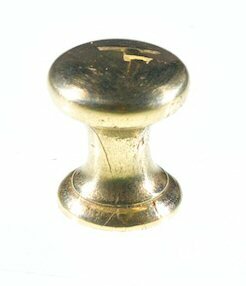 This was done by bushing the holes with a soft dowel (it reminded me of modern piano hammer shanks) and re-drilling. The new holes were drilled all the way through the wrestplank, and the instrument was re-strung using modern steel zither pins, which were driven right through the plank, projecting only 12mm above the plank, protruding 5mm below it. These pins did not hold. The soft plugs which had been used previously were about 5.5mm in diameter already; had they not been, it would have been better to have a 5mm plug cutter made since no more of the original material should be cut away than is necessary to achieve a good glue joint with the wood of the new plugs. If the drill size and plug size are correct there is no stress placed on the remaining wood of the wrestplank, but the joint is tight. Before attempting this on the instrument I experimented by drilling and plugging some pieces of old oak; some not much wider than the diameter of the plug. I cut them apart when they were dry to see just how clean the glue-line was, and if the insertion of the plugs into these pieces of wood had made them wider. When I was satisfied with the combination of the fit of holes and plugs and the viscosity of the glue, the whole wrestplank was done. New traditional pattern tapered tuning pins were made from 3.5mm nails. The pins being quite close to the nut bridge meant that the strings used to ride up the pins; the new holes were drilled at an angle to the vertical to reduce this tendency. The holes were drilled completely within the new plugs so that in the future these wrestpins can be removed, their holes plugged, and the bushings re-drilled if necessary without further disturbing the original material of the wrestplank. After the new strings had stabilised, tuning proved very stable. We all know that most restoration is impossible without damaging some original fabric. The real problem always lies in assessing whether more good will be done both for the instrument and for future researchers by restoring and documenting properly, or by leaving it alone. This particular instrument has by all accounts not sounded or played as well as it does now at least since it returned to Europe in 1946, and probably for a lot longer than that. It is reprehensible that it should have had an original piano action removed, but if it weren’t for such things happening lots of people wouldn’t have quite so much to write about. I believe that we must consider carefully the actions we take when considering whether to restore, how far to restore or whether just to conserve, but also shouldn’t we spare a thought for the original makers’ intentions? I know that I’d be chuffed to bits that an instrument of mine was still giving pleasure and being used for making music in 200 or 300 years, and if it was altered a bit I don’t think I’d mind. The arguments to not do any restoration work are persuasive; as the restorer becomes more experienced it becomes more difficult to make decisions such as whether to, and if so how to bush this wrestplank, to take a simple example. However, many of us are lucky enough to do work for clients who do wish their instruments to play and have bought them with that in mind. What we ought to do is to disseminate our techniques so that fewer instruments are badly restored simply because the restorer didn’t have one piece of information. We shouldn’t have to learn techniques by trial and error on antique instruments any longer; none of us will last as long as the instruments, so we have a duty to record what we do for others, not just in a restoration report seen by a filing cabinet. To address this problem would be of great benefit. What do others think? I know I didn’t like seeing restoration information in a coffee-table book on instrument making a few years ago, but perhaps within the ‘covers’ of this publication we should make a concerted effort to formally record our methods and solutions to restoration problems, since as Robert Cronin pointed out in comm. 1278, ‘the FoMRHI membership is almost entirely made up of professionals’?